This month's CotM article relates the personal experiences of Swiss fishkeeper Christophe Giradet, known to many on our forum by the username of ElTofi, with some big plecos kept in big aquaria. Back in 2009, I had a very cool experience with chance breeding of Pseudacanthicus sp. L025 which happened three times. In the same Rio Xingu tank of 1600 liters, were also Panaque cf. armbrusteri L027 Xingu. I had three of them for five years and they were about to get mature enough to make a tentative of breeding when this whole tank finally went wrong. A lost all the L-numbers it contained. I was mad and disgusted but after a while, I at least partially recovered and the "fever" went on. I began a new project; it would be bigger. Meanwhile, the Panaque took a dive into a 720 liters (200x60x60 cm) aquarium together with Pterophyllum altum where they stayed for almost a year. The tank was "Orinoco blackwater", with a 30% weekly water change routine using full Reverse Osmosis water. I was lucky enough to work in a biopharma firm and RO water was a raw material there. The tank had a quite hard basic sand and three big new tree trunks still releasing lots of tannins. The Panaque were fed with hikari chips, nori leaves (sushi algae), sweet woods (Alnus glutinosa, Betula spp.) and sera discus granules (which they loved). Considering this routine, when my " Big Tank" was finally ready in September 2011, my six babies had grown to 14 cm TL, which is quite impressive for fish which are supposed to grow slowly. I guess the key was heavy water changes, lots of varied food and enough space. From that time on, they went on growing, together with other bottom dwellers (four Panaque schaeferi, two Pterygoplichthys spp. and two Acanthicus adonis) into a bigger tank (10m3 approximately). The routine in this big tank is quite different. Considering the volume, I stopped using RO and replaced it with tap water. Luckily, my tap water is quite soft (around 200 micro-siemens) which allows me to make continuous water changes drop-by-drop (with an overflow to waste) up to 100% weekly. They had space, they had "soft woods", they had heavy and regular fresh water and they had food. Especially new was some "meaty" food, leftover by stingrays, Arowana, Cichla and Acanthicus. I discovered that Panaque never read the books which defines them as wood eaters. So they tried (and loved) mussels, shrimps, sturgeon pellets and smelts. They grew bigger, much bigger! In May 2015, I realized they were pretty big and probably mature enough to try breeding. Therefore, I set up a 900 liters tank especially for them. And then, in June 2015, I took them from the "Big Tank" to set them up in their own spawning tank. Fishing out big Panaque from a big tank with relatively natural decoration (it was filled with several two meters long tree trunks) is not an easy task. So I used a Tunze 20m3/h pump to create a big flow along the front wall (low part of my tank). I soon discovered they loved to come into this flow and were much easier to catch with a net than hunting them from under a root. I caught them all within a few days and could measure them out of the water to get exact data. The biggest was (June 2015) 36 cm TL. The smallest was 28 cm TL. I'm still uncertain about sexing, even if Stephen Huang (yes, the one who bred Panaque cf. armbrusteri) gave me a few tips and tricks from his experience and background. Out of the genital papilla trick (which I'm still unable to use), Stephen told me about head shape, ventral fins and pectoral odontodes. Their head shape is supposed to be much higher, larger and shorter in the male. Ventral fins should have a thicker hard ray in the male. Opercular odontodes grow during the mating season for both males and females, but they should be bigger, longer and thicker on males. On my biggest fish, opercular odontodes have grown to 5 or 6 cm long. Considering pectoral odontodes, they seem to be much bigger on males. I still haven't observed a difference on this point as I stopped the breeding attempt after seven months. I will take another attempt next year. This species has a dull (not red or orange) eye and a basic olive colouration that greys with age and, irrespective of age, black longitudinal stripes. Young fish show a white ring around the caudal peduncle, a windowed or clear caudal fin and white tips to the fins. 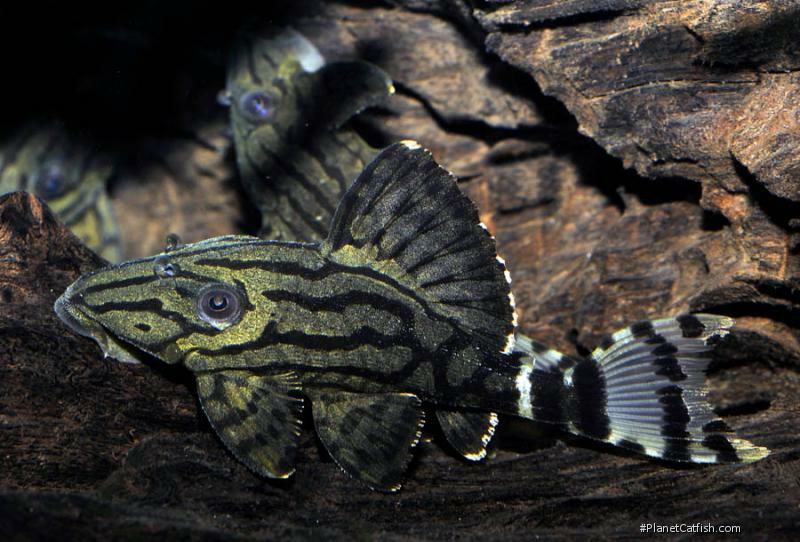 Sexing Undocumented, although with most ancistrine plecos the genital papilla of the female is round and blunt, that of the male by comparison is smaller and pointed. It is not known at what size this method of sexing can be used on Royal Plecos. It is possible that heavy odontal growth is associated with males. .
General Remarks It is thought by some that this species most closely matches the description of the Blue Eyed Pleco, Panaque suttonorum. In adulthood, it is grey with dark grey spots and dashes. In youth, especially, it shows the white caudal peduncle ring. It's likely a close relative unless the Maracaibo species is proven to be surprisingly widespread. Suggested Tankmates Most community fish, this fish is very secretive and so you will want more active fish around to provide something to watch. Larger specimens will work nearly all but the most ferocious and agressive fish. Smaller specimens should not be kept with large predators, for obvious reasons. There are 174 registered keepers, view all "my cats" data.